Capturing a wild bird is a delicate endeavor. You must be certain not to harm the bird or its feathers. There are cases where the welfare of the bird depends upon its capture. For instance, the bird is trapped in your home or place of business, or a fledgling or nestling has tumbled from its nest and is in harm's way. In the case of a fallen or disabled bird outdoors, be sure to place any predatory pets inside or in their pens or kennels. Determine the state of the bird in question. If it's young, it should be alert and moving about on the ground. If it's inside your home, it should also be alert and mobile, either flying or perching on high spots. Use a large piece of sheer fabric, such as a transparent curtain or drape, or a beach towel or cotton sheet. Sheer fabrics work best because you can keep an eye on the bird once it's trapped. It also is better for the bird, as air can flow freely around it. Hold the fabric in your outstretched hands, and approach the bird. If indoors, "herd" the bird into a corner. If outdoors, approach the bird carefully, following it as necessary. Throw the fabric over the cornered bird gently. Wearing gloves, carefully take up the bird in the fabric, holding it in such a way as to reduce flapping and feather damage. Take an injured bird to a veterinarian immediately. Transport in a paper bag lined with newspaper and the top folded down securely. A bird trapped indoors with no sign of injury can be released outdoors immediately. The larger and lighter your "trap," the easier it will be to capture the bird. Do not put a wild bird in a metal cage; they will seriously harm themselves trying to escape. Call a wildlife rehabilitator, a professional trained to deal with injured wild animals, if you have any doubt about your own ability to safely capture an injured bird. 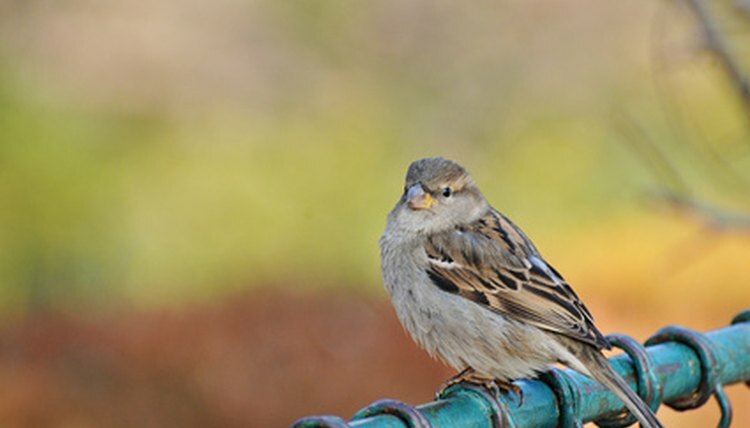 Avoid handling the captured bird, and remove it from the trap as quickly as possible, as birds over-heat very easily.